Throwing Heat: Jackie Mitchell struck out Babe Ruth and Lou Gehrig, then got fired for it. PITCHER JACKIE Mitchell was so far ahead of her time, it's a miracle she had a chance to display her ability at all. Luckily, her father--an optometrist and evidently a clearsighted man--encouraged her to play baseball. Soon she was playing in amateur games, once striking out nine men in succession. In March 1931 Mitchell was polishing her pitching skills at a baseball camp in Atlanta when she caught the attention of Joe Engel, owner of the Class AA Chattanooga Lookouts. A showman and a lover of a good gimmick, Engels offered the 17-year-old southpaw a minor league contract, planning to pit her against the legendary New York Yankees in an exhibition game. "The Yankees will meet a club here that has a girl pitcher named Jackie Mitchell, who has a swell change of pace and swings a mean lipstick," it sneered. "I suppose that in the next town they will find a squad that has a female impersonator in left field, a sword swallower at short, and a trained seal behind the plate." The game took place on April 2, 1931. It had rained the night before, so the footing was treacherous. Four thousand people turned out, including dozens of reporters, wire services and a newsreel camera. 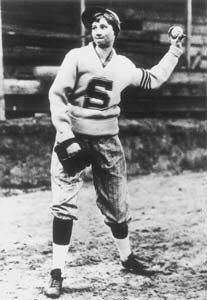 Manager Bert Niehoff started the exhibition with Clyde Barfoot, but after Barfoot opened the game by giving up a double and a single, Niehoff signaled for Mitchell, who took the mound dressed in a custom-made baggy white uniform. The first batter she faced was Babe Ruth, who walked to the plate, tipped his hat to her, then dug into the batter's box. Mitchell had only one pitch--a wicked sinker--and it was working that day. Ruth swung at the first pitch and missed. After the count went to two balls and a strike, Ruth swung at another sinker--and missed again. Mitchell's fifth pitch painted the corner of the plate, and Ruth was caught looking. The Babe kicked the dirt, chewed out the umpire, threw his bat down and stomped back to the dugout. The plucky 130-pound teenager awaited the next batter, the 200-pound Lou Gehrig. Gehrig swung at and missed the first pitch, then he swung twice more, hitting nothing but air. The crowd rose to its feet, cheering wildly. Mitchell had just fanned the "Sultan of Swat" and the "Iron Horse" back to back. She followed the Gehrig strikeout with a walk to Tony Lazzari, and Niehoff pulled her. The story was all over the papers, and Universal Newsreel replayed film of the game in theaters across the country. The baseball establishment reacted promptly and without mercy. Within days, baseball commissioner Kenesaw Mountain Landis voided Mitchell's contract on the grounds that professional baseball was too strenuous to be played by women. A crushed Mitchell found herself confined to "girl" teams and exhibition contests. In 1937, burned out by degrading gimmicks like playing an inning while riding a donkey, she retired and went to work in her father's optometry office. She was 23. Was Mitchell the real deal? She could certainly pitch. And the possibility that Ruth and Gehrig played along with a prom stunt seems at odds with Ruth's subsequent display of anger. Either way, Mitchell's professional career lasted only two-thirds of an inning, but it was one helluva two-thirds. Largely forgotten after her retirement, she re-emerged in 1982 to throw out the first ball on the Lookouts' opening day. From the March 10-17, 1999 issue of Metro Santa Cruz.